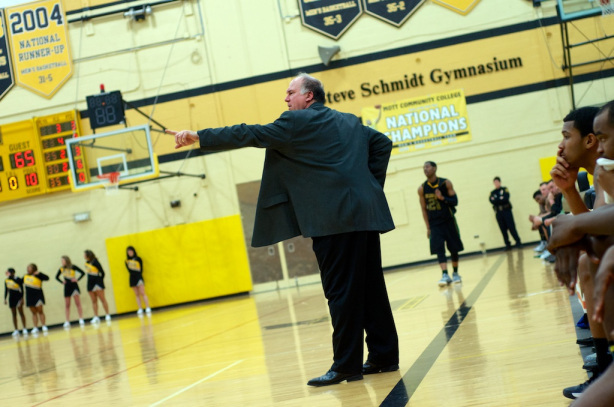 Steve Schmidt’s team knocked off Macomb on Wednesday night, 71-67. The Bears have now won two straight games and should make it three Saturday against Alpena at home. FLINT, Michigan — The Mott Community Bears returned to old form on Wednesday night, forcing three turnovers in the pivotal final two minutes to beat Macomb, 71-67. The Bears led by two at the half and returned to the floor determined to pressure the ball. Mott threw everything but the proverbial kitchen sink at the Monarchs in the half, taking advantage of their opponent’s relative weakness in the backcourt. The Bears held Macomb to just 11-for-30 from the field in the half and forced seven turnovers. Mott head coach Steve Schmidt was encouraged by the defensive effort in the half, but isn’t quite ready to say his team is ready for prime time. Mott led by as many as nine points with seven minutes to go in the game before a basket by Macomb’s Elijah Carter cut the Bears’ lead to one with just less than two minutes to go. Mott did not allow the Monarchs to score another point. After both teams traded turnovers on four consecutive possessions, Mott’s Daryl Bigham got loose in transition, drew a foul, and made both free throws. In the game’s waning seconds, Mott guard Malik Young made one of two free throws to put the game out of reach. Mott desperately needed to win this game in regulation, as their top two forwards (Bigham and Darryl LeVert) had four fouls apiece and their next man up (Matt Place) had already fouled out. Place, who sets the bar for effort on this team, received quite an ovation after he earned his fifth foul. “That was the best ovation from fans for a kid who fouled out that I can remember,” Schmidt said. The veteran coach also complimented Macomb and lauded the parity in the conference this season. There isn’t one great team in the conference, but there really aren’t any scrubs, either. The play of the game came with five minutes left in the second half, when LeVert slammed home a tip-dunk that brought fans to their feet and put the Bears up seven. Brandon Hicks led Macomb (10-9) with 18 points and six rebounds. Chris Dorsey added 15 points and five rebounds. Bigham led Mott (13-6) with 14 points and 11 rebounds. Levert, Justice Green and Austin Daniels added 11 points apiece. Mott will return to action at 3 p.m. Saturday at home versus Alpena. This month, the ‘Jacks have scored wins over Wayne County, Delta, Mid-Michigan and Henry Ford. The game can be heard live on the Michigan Regional Sports Network, at MRSN.us. When you first play tic-tac-toe(or any new game for that matter) the easiest strategy is to copy the winner’s moves. The Bears growled like men and won. It could have easily went the other way. I may just print this article and laminate it. Nice win.